The High Coast Bridge is one of the biggest suspension bridges in the world. The geographical location places great demands on the structure's insulation and surfacing systems. Average winter temperature is around -20°C with the thermometer falling as low as -40°C; while summer temperatures can reach as high as 30°C. The bridge construction project was preceded by comprehensive preliminary studies. No fewer than eight different systems were tested before polymer modified mastic asphalt was chosen for the protection and binder layer, with a polymer modified, aggregate rich asphalt concrete selected for the surface course. The original road surface on the High Coast Bridge had remained unchanged since 1997. This was an impressive lifespan considering the traffic intensity, the high proportion of studded tyres and the large scale application of salt in winter. 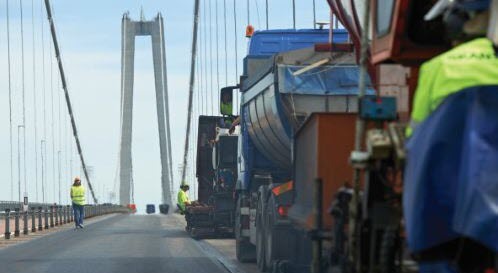 In order to prevent future cracking and aggregate loosening, the Swedish Transport Administration decided to relay the surface on the bridge in 2012. As it had done in 1997, Nynas supplied the polymer modifiedbinder – Nynas Endura F2 (with similar end performanceproperties to the binder used 15 years ago) – while Skanska was responsible for asphalting. According to the road authority, the original surface was in surprisingly good condition considering its age. Had this been an ordinary road, maintenance could have been postponed for another year or so but for this type of bridge, safety margins are tighter. Specifications relating to quality are also tough. The surface was heated to 70°C before laying to ensure good adhesion to the mastic asphalt, and self adhesive thin surfacing was also used. In addition, use of static compactors was necessary because the bridge structure could have been damaged by strong vibrations. A total of 2200t of asphalt was used for the 26,000m² that thefour lanes, each of 1800m, cover. The thickness of the surfacecourse was set at 35 mm. This type of polymer modified asphalt is very elastic – a crucial benefit in view of movements in the bridge. Use of a conventional asphalt can lead to cracking in the surface and aggregate can loosen. This can then abrade paint on cables and beams, resulting in expensive rust damage. Nynas is reclaiming the binder from the old, recovered asphalt for further analysis. The hope is that this will provide a good picture of changes over time in a polymer modified binder, which can produce important information for continued product development work. Download this information on how Nynas Endura F2 was used at The high coast bridge, Ångermanland, Sweden, as a pdf.